The museum library started collecting publications simultaneously with the creation of The Historical Museum in Sanok in 1934.. Before outbreak of the WWII, the library collection amounted around 500 volumes, including a collection of forty very precious parchment documents strictly referring to the town’s history (1360-1784). During the German occupation, the library collection was severely damaged. Some of the most valuable publications (e.g. the privilege of the king Kazimierz the Great from 1366) were spirited off. The documents and books which have been found, have never come back to Sanok. After the war, the library collection began its systematic expansion through the purchases made at bookstores, antiquarians and also thanks to donations from persons connected with scientific activities in the field of the Sanok region history. 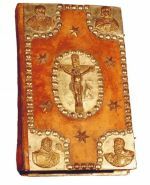 The publications, often obtained from the surrounding manors and the Greek Catholic and Orthodox churches in order to save them from destruction, constitute quite substantial part of the collection. 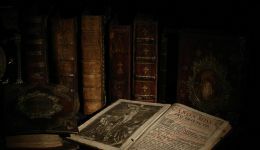 There are numerous liturgical books in the Old Church Slavonic language which constitute a valuable part of the library collection, ranging the period of the 16th – 20th century. In spite of signs of damage, some of them interest in its level of manufacturing, such as the 16th century manuscripts: Gospels, Oktoichs, Minejes, Apostols. Among the old prints (until the end of the 18th c.) we can find editions in leather bindings with metal ornaments. 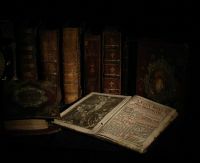 They are Gospels, Sluzebniks, Irmologions, Psalters, Triods and others. There is also lot of later issued publications from the 19th and 20th c.
In 1946 the library collection was expanded by the library of Krasicki family from Lesko and part of the library of Laskowski family from the manor in Bazanowka. It is, above all, the 18th and 19th century literature in the Polish, German and French language. There are also magazines. Let us mention the most interesting: ‘Polish Review’ having been issued in Cracow from 1866 to 1913 and ‘Science and Literature Guide’ having been issued in Lvov from 1877 to 1919. The museum library has also got a number of publications referring to the history of Sanok and the region. ‘The municipal and county files from the time of the Polish Commonwealth from so-called the Bernardine Fathers archive in Lvov (...)’ draw special attention. These are the oldest judicial records of the municipal and county court printed in twenty five volumes in Lviv between 1868 and 1935. They represent a rich genealogical and ethnographic source for researchers. Sanok files have great significance for getting knowledge of interesting past of the Sanok county. They belong to the oldest among survived, and begin in 1423. A collection of ‘schematyzms’ of the Catholic and Greek Catholic church of Przemysl diocese is also an extremely valuable source of information about our region. These periodically issued juxtapositions of staff and historical and statistical information concerning the diocese are an excellent and valuable scientific source. We must mention that the library collection of The Historical Museum hold a collection of dozens of books printed in the printer of Karol Pollak (including editions of the series of the ‘Polish Bibliotheca’ and ‘Polish Library’) and series of magazines having been issued in this printer, which were closely connected with life of our town. Let us name some of them: ‘Sanoczanin’, ‘Glos Ziemi Sanockiej’, ‘Ziemia Sanocka’, ‘Tygodnik Ludowy’, ‘Tygodnik Ziemi Sanockiej’. They give very interesting insight into life of the town from the time of the Galician Autonomy. Discussing the editorial positions of conventionally called the regional publications, it is hard not to mention the valuable acquisitions, such as ‘Reports of the Gymnastic Association Sokol in Sanok’ (1898-1932) and ‘Reports of the Director of k.u.k. Gymnasium in Sanok’ – obviously partly incomplete with marks of damage being in the wake of ordeal of the occupation. Apart from the antique collection, the library contains also the editorial positions from the recent period. The profile of the collection is affected partly by the structure of the museum, thus disciplines which are currently represented in the museum such as: archaeology, history and history of art. Obtaining some part of the publications through the way of interlibrary and intermuseal exchange is an important feature of the library collection of The Historical Museum. The library of The Historical Museum in Sanok is primarily a scientific facility for the museum staff. However, the outer readers can also benefit from the library collection as well, but after satisfying certain requirements. The books and magazines can only be used in the reading room.